After the politically stultifying years of Blair/Brown and its aftermath under Miliband, Labour members voted for a left-wing leader in 2015. This was a palace revolution without a changing of the guard. All the old structures and place-holders remain largely unchanged. They were, and are, either incompatible or largely hostile to the new leadership as has been demonstrated publicly on numerous occasions. The essential point is that the new leadership did not come to power on the basis of winning a series of battles for policies and positions following which the whole thing was consolidated by the election of a new leader. Jeremy Corbyn became leader on the basis of a growing sense of dissatisfaction with the political elite in general and with the leadership of the Labour Party in particular. Miliband claimed to be making a break with Blairism but was unable to do so other than rhetorically. In Corbyn the majority of members saw the chance for a real change of direction. Many saw this as an opportunity to revive the ideals of socialism and democracy. But Corbyn’s election was just a first step. All the work still remained to be done. New policies needed to be put in place and people supporting those policies needed to be elected to ensure that they would be pursued with intelligence and enthusiasm. After two years of the new leadership the struggle for both of these things can only be said to be at an embryonic stage. The situation is weak and precarious and will remain so until the battle for policies and positions is won. It is against this backdrop that we should consider the Annual Report of the National Policy Forum to Annual Conference this year. It is Annual Conference that sets the seal on Party Policy, in theory at least. It does so on the basis of its approval or otherwise of the NPF’s Annual Report. The Labour Party Rulebook makes the position clear. Those wishing to consolidate the position of the left leadership of the party need to think about this very seriously. In recent years the reception of the Annual Report has been a non-event and has in effect gone through on the nod. It was difficult to raise objections because the report was considered on an all or nothing basis. Rejecting or referring back any part of it meant doing so for the entire report. Clearly few Conference delegates were ever going to feel in a position to do that. This led to a situation in which many (most?) delegates did not actually read the report. Some delegates didn’t receive the report in time to discuss it with colleagues and some didn’t even receive it at all. The series of articles on Left Futures reviewing six of the eight Policy Commission sections of the Annual Report have pointed to a uniformly lack-lustre and lethargic approach to the development of policy. Review of the housing part of the Housing, Local Government & Transport report. Unfortunately we were not able to get a review of the report from the Justice & Home Affairs Commission but we have covered seven out of eight of the reports and the message from those seven reviews is loud and clear. All seven reviews have been consolidated into a single document which you can download here. In my view the leaders of Momentum and the CLPD, and everyone keen to consolidate Labour’s left turn, should seize the opportunity provided by voting on the separate parts of the NPF Annual Report and should encourage delegates to read the reports thoroughly and to read the reviews that have been published (on Left Futures and anywhere elsewhere this has, unknown to me, been attempted). 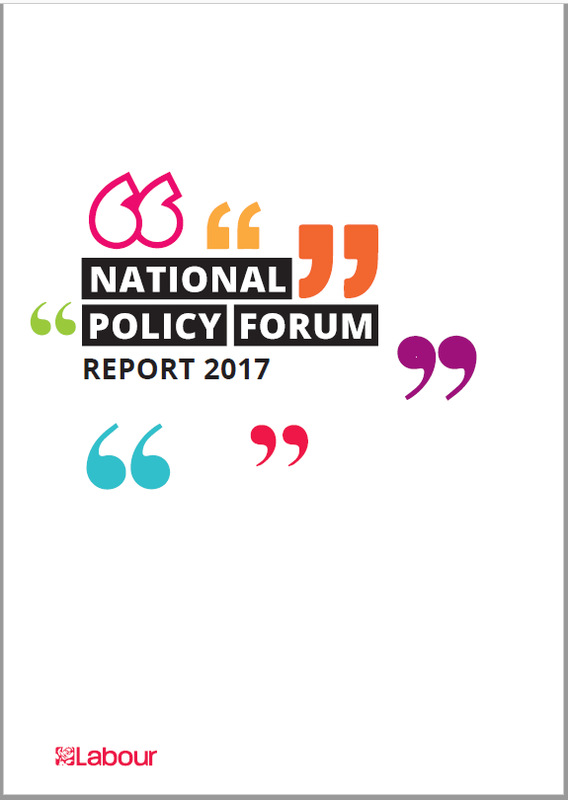 A reference back of one or two of the very worst of this extremely poor collection of reports would send a much needed signal that the present approach is not delivering the policy-making process that the Party needs and deserves. A glimmer of reason in Labour’s policy on Trident? After Blair/Brown, and in contrast to David Miliband, many allowed themselves to believe that Ed was on the left and even that Ed Balls would be a great shadow chancellor. The illusion gradually evaporated. Thanks for all the work you put into this David. I think it was a worthwhile effort. The document seems a considerable start and reads so much more than its separate parts. I think I can make good use of it in my CLP which is what I shall do. It will also stimulate others to identify areas in which they can add or elaborate for future development. However it doesn’t half look embarrassing to members of the Policy Forums. Surely this will challenge them to make a start on the job some thought they were supposed to do. The only problem for them as I see it is that presumably they did not intend to be as non committal as they were (it can b no fun trying to say nothing); they were responding to the circumstances in which deep division and conflict was the norm within the groups and no one knew how to get out without just continuing with the divisions they they were seeking to side step. Fine piece of work , David. It would be wonderful (for a radical renewal of Labour’s currently laughably poor “policy development process” ) if Conference is alerted by this collection of critical reviews to “Refer Back” at least one of the NPF Policy Reports this year. I volunteer as candidates at least the particularly dire International (including Defence) Report , or the Education one – which , as you say, doesn’t even mention Academisation ! But basically they should ALL be referred back, if Conference was as up to speed with the games the Right are still playing to run policy rings round the Left as it should be. I think the apparent strategy of the Corbyn circle in just letting the farce of the current barren NPF process continue as is , must be the experience with the 2017 Manifesto, constructed in Jeremy’s Office with no real reference to the tortuous NPF process at all ! This “top down” approach from the Left seems superficially OK in terms of the recent result , ie, a well-received Left Keynsian Manifesto; but this strategy leaves the mass membership as politically uninvolved in real policy formation as under Blair et al, and dangerously politically uneducated. Come a Labour government (even possibly next year as the Tories implode ?) and the Money Markets and speculators generally will soon have a Corbyn Government on the ropes economically – under pressure to “do a Syriza” and become tame stooges of the capitalist markets , as Harold Wilson had to do eventually to get an IMF loan. In this situation a politically educated Membership utterly committed to pursuing a Left Keynsian policy programme through hard times , providing mass support in workplaces and the streets, will be vital. A “top down” policy development process by the Corbyn circle just won’t deliver this. Agreed, ideally we would see them all referred back. If that is not possible, I think you make a strong case for International and Education to be the focus of attention. Personally I was particularly irritated that the Environment/Energy report only referenced submissions which went along with what they wanted to say while completely ignoring any of those arguing otherwise. However, I’m objective enough to know that the degree of my irritation is just because it was my submissions which were ignored. I know for a fact that the Education Commission behaved in a similar way, plus produced even worse policy than Environment/Energy. No doubt the same goes for International. I think the way we organise Party meetings is part of the problem and yet we treat them as if they were the basis of a solution. You obviously have a substantial CLP if you need a mic. but at mine I could whisper and everyone is still capable of treating the contribution as a political intervention (and therefore ultra vires) imposed in a self – congratulatory get – together. One root of the problem for me is that the once a month meeting with one hour ‘political/policy discussion split into single 3 mins (max) contributions on a once a year revolving topic basis with little follow through. For the typical CLPs, in my view, we need to encourage a culture of multiple depth discussions to engage a wider range of interests and expectation. Of course we need to overcome the distrust inherent in such a sincere intent. I do realise that one general meeting once a month on whatever comes up, has the potential to serve an important function of equally engaging ‘all – comers’, but I do not see how the discussion I experience can ever bring about radical change without finding a formula for multi-level discussion (and activity). Do CLPs even relate much to that which arises in the Party conferences? Is it not in other fora that such links are created? And we then pretend that the CLPs are the engines. Yes, the organisation of branch meetings really is a problem. Mine must be intermediate between yours and those of Chris. We have about 40-50 people their (from four branches) so we don’t need a mic but they are shambling and generally rather aimless. Some of us try to inject some politics with papers and proposals but that has not changed the character. We have tried to make councillors give written reports instead of long verbal ones about their wards. That has been a partial success, mercifully, but overall there is no sense of achieving anything, of resolving issues of difference or developing new ideas. I gather that other branches in my CLP are much worse. Many branch officers are also councillors and in some cases lead members (the council has a cabinet system). There is a virtual complete disconnect between the Labour council and the CLP. We have consultations over the budget but they are completely phoney. My meetings do virtually nothing to help members understand and participate in what is going on in the Party. The level of information is near zero. I think the organisation of branch meetings and how to raise their political level while still being inviting to all strands of opinion is a major issue. How about starting a discussion with an article on that? Good piece David and good points John – the top down manifesto was great but it would help if we all felt we owned it and had helped to construct it! We on the Left know the NPF was set up as a fig leaf for internal democracy by the Blairite Neo-Liberals to be subsequently IGNORED. In my city in the 1970’s we used to have a well attended District Labour Party which was attended by branch delegates and trade union delegates (before the top down Executive Boards and the weak Labour Campaign Forums were introduced) and we used to elect working parties. I was on housing and we had a brilliant Chair who took us on site visits to estates and homeless projects and we would regularly report to the District Labour Party and they would then draw from our work for Labour’s Local Council Election manifesto at the special District Labour Party manifesto meeting. So perhaps this is what we need, scrap the NPF but replace it with working parties by topic and we all elect (hopefully passionate people) and a Chair but charge them with a strict deadline. But I would argue by topic we need a balance of experts such as for housing – academics, housing workers, activists and experts by experience – social housing tenants, owner occupiers, private rented tenants. These should be elected by members in say June (and each candidate has to submit a statement why they want to be on this group and on some of their ideas) then the working parties must meet monthly or bi-monthly but engage in discussions in between meetings on-line to produce a report by March the following year to be sent the NEC and CLPs. Someone, some group of members needs to come up with stimulus-response documents and as we have shown on here there are plenty of socialists out there with ideas and this is the crux of the matter, we need to draw from the vast life experiences of our grassroots Labour members and grassroots trade unionists. CLPs could then arrange their business to discuss the drafts and send amendments to the NEC for Conference (they have 6 months to discuss the reports) and why they could even have some local community conferences by topic i.e. on housing where draft ideas are shared with Labour members and voters plus those interested in the topic. We then take each report and amendments at Conference in September say numbered in key points 1-10 or so and vote on each point and amendments. Each points or the whole documents could be referred back if the majority at Conference are not satisfied. Just some food for thought and perhaps CLPD could come up with a resolution that covers the organisation of policy development and some of us are bursting with ideas. But perhaps this is what grassroots members (and local Momentum Groups) should also be exploring. Neo-Liberalism’s greatest victory I would argue was to stop the Left from dreaming, time to start dreaming again! Back in the 1980s CLPs and affiliated organisations had the right to submit resolutions of decent length on policy. I suspect that this led to policy of far greater substance, quality and attractiveness than is the case with the NPF. In the final analysis it’s an empirical question, and one could go back to the official reports of Annual Conference of the 1980s in order to verify that this was the case. The Labour Party should abolish the NPF whilst retaining a Rolling Programme to which CLPs and affiliated organisations could propose amendments at Conference each year. The RP would serve as the definitive statement of Party policy. The NPF by contrast is one big exercise in “going through the motions”. It has long served as a cover for leadership dictat on policy, an arrangement which does not suit the Left in the long term and is the polar opposite of party democracy.